A Reverse Osmosis water system works on a simple and straight forward process. It pushes water with high pressure through a semi permeable membrane which filters out impurities. During the process, the contaminants like majority of dissolved salts, organic matter, bacteria and pyrogens do not pass the filter membrane get flushed out of the system leaving pure drinking water for the user. Reverse Osmosis water filtration systems are not new. In fact the American population has been using Reverse Osmosis water filters since 1977 and is still considered one of the most effective methods to purify water. The sediment filter is also known as pre filter which is designed to strain out the macro contaminants like dirt, silt and sediments. They make the further process of filtration easier by stopping the macro contaminants from reaching the delicate layers of filter membrane. 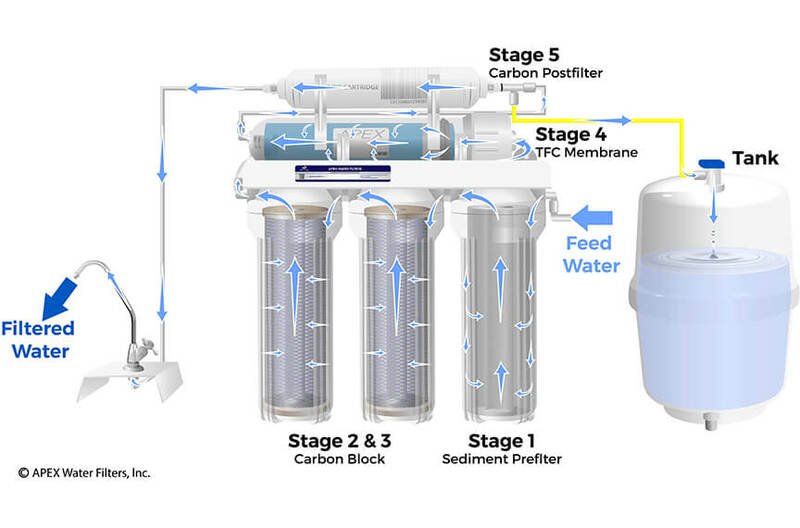 A carbon filter is designed to filter chlorine which is abundant in municipal water especially in the metro cities of America. Carbon filters also remove unpleasant odors and taste from water. The reverse osmosis membrane is the most delicate and essential part of reverse osmosis filtration systems. It allows pressured water through it but blocks almost every contaminant as small as 0.25 microns. The polishing filter is the last stage which provides additional filtration to remove essentially any left-over minerals, odor and taste to provide polishing to the filtered water which is optimum for daily drinking purpose. All the contaminants are removed using water that flows back through all the membranes to flush them out through a drain valve. This increases performance of the filters and prevents blockage of the membranes. A good reverse osmosis water filtration system provides up to 99.5% of clean drinking water. Water is essential for life and filtered water is essential for healthier life especially in the current amount of pollution in the water supply of metro cities of America. Reverse Osmosis systems remove pollutants from water including nitrates, fluoride, pesticides, sulfates, chemical and pharmaceutical waste, arsenic and organic matter which are harmful for your health. Reverse Osmosis filtration systems improve the water quality by removing any unpleasant odor, color and taste. This helps the users get better drinking experience and increases their water consumption frequency and quantity too. As a result, users consume the essential amount of water with increased appetite of water to stay healthy. Reverse Osmosis water filters are simple in terms of both functioning and maintenance. The filter cartridges are cheap and most of the companies provide free services along with long term warranty of up to 25 months. Buying a good Reverse Osmosis system from a reputed company like Apex Water FiltersTM will help you get the benefits of free delivery, installation and maintenance to ensure long lasting performance for optimum results. Due to advancement in technology and consistent innovation in Reverse Osmosis systems of Apex water filters, the cost of buying has dropped down by 35% in the last 5 years. The replacement cartridges and membranes are also cheap and can be bought easily online. Reverse Osmosis systems are like one time investment which provides pure drinking water for up to 3 years with proper maintenances and cleaning. As a result your expenses of buying bottled water reduce dramatically. This makes them the best and most popular water filters in the American households. Apex water filters is one of the leading reverse osmosis water filtration solutions company in America with its exclusive reviews from clients. It provides the best quality of water filters that last long with additional features like free delivery, installation and yearlong warranty.